Life Before the Dinosaurs: My Trip to the Smithsonian Museum of Natural History. My Trip to the Smithsonian Museum of Natural History. Today I went to the Smithsonian Museum of Natural History. It was really cool. I really loved it because it had so many cool Paleozoic fossils, like Carycrinus, a four-foot-tall crinoid, and Dunkleosteus, a giant armor-headed fish, and the spiral saw of the mysterious shark Helicoprion. They also had Anomalocaris claws and an Anomalocaris mouth. And unclassified animals like Opabinia, Wiwaxia, and Eldonia. I was very sad that all the fossils of Pikaia had signs on them that said, "Specimen has been removed for study." The head armor of Dunkleostus and the spiral saw of Helicoprion. There were also many different kinds of trilobites, like Elrathia, Wallicerops, Isotelus, Olinoides, and Dicranurus. There were also some specimens of the marellamorph Marrella splendens. There were priapulids like Ottoia, Louisella, and Fieldia. There were also annelids like Canadia and Burgessochaeta. With a whole rack of Elrathia kingii. They also had the Cretaceous crinoid that did not have a stalk, Uintacrinus. They had amazing rudist clams, like Titanosarcolites and Hippurites. The museum was awesome. I really liked the armored jawless fish Drepanaspis. I got two fossils at the gift shop that I don't know what they are. There is a coiled cephalopod in this picture that could be Cenoceras or Placenticeras. The oak leaf pattern on the shell does not have pointed leaves. It also has a shiny red color on the shell, and a large space that the animal lived in. If you know what this is, could you please tell me? Ammonite (or coiled nautiloid?) fossil. I also got a trilobite about one inch long. It has a pit in it that I believe could be a bite mark, because I see marks inside of the pit that look like marks made by teeth. It has an abdomen, or pygidium, which has rectangular plates along the side that stick out from the rest of the pygidium and are very small and give the pygidium a feathery appearance. The eyes look like curved ridges, and the middle cheek, or glabella, is ball-like and has a very thin lobe on the bottom. And I have no idea what it is, so if anyone can identify it, please do! I'm sure you were bummed about not seeing some Pikaia samples. But how great that someone is studying them for something! You should follow up with the museum and see what their scientists are doing. There is SO MUCH to see there. What a very special trip for you! And, your mom did an especially great job with the typing and linking today! So many of the things you saw you have already covered here on your blog. Very cool! 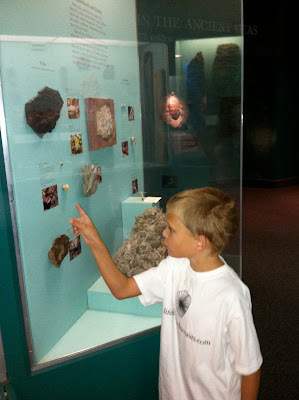 I think getting to see fossils of the creatures I wrote about on my blog was cool! I hope you get to see the Burgess Shale display @ The Field Museum in Chicago some day. I started following your blog just recently, and amazingly, I visited the Smithsonian Natural History museum only a day after you on the 13th! I didn't get to see everything, but the models of prehistoric sea life have been some of my favorites since first grade. I hope I get to see that too, because it does sound cool!!!!! I like the models too, but I also like the fossils. Yesterday I got a model of Laggania cambria because I learned to tie my shoes!!!!! I'm about to start second grade and I just learned to tie my shoes! Do you have a camera that can take extreme close-ups of those fossils ? Not that I could identify them but the way you describe that trilobite makes it sound so cool.